Nashville up-and-coming star Jameson Daniels has all the women and fame he can handle, covering up a secret past. A chance encounter with members of SEAL Team 3 changes the trajectory of his life, and his willingness to confront his past. Lizzie Reeder has a secret she’s hidden from the one man in the world who should know. Would telling him be an act of love, or an act of desperation? Post on my FB page that you left a message here at Just Romantic Suspense and you could win a free copy of Nashville SEAL, in any format, and I mail internationally. 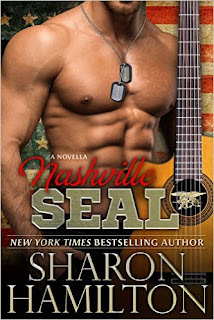 I love Sharon's SEAL books! I look forward to reading Nashville Seal. I hope you had a wonderful and peaceful Christmas. I haven't read your books but have good things about them. Look forward to reading this one! You guys are awesome!!! All lucky 13 of you win a book from me, regardless of the contest I posted on my FB page. THIS IS IN ADDITION. Please email me with JUST ROMANTIC SUSPENSE in subject line, and I'll send Fredo's Secret or Nashville SEAL in audio, print or Kindle version (Nashville SEAL is only on Kindle). Send your response to: sharonhamilton2001 (at) gmail (dot) com. CONGRATS! Omg I'm dying right now!!! Super excited!! You. Rule! Love all Sharon's books! Her Seals are hot. Love your books! THanks for sharing, can't wait to read it!